Guinea pigs aren't prey to many viruses, but those that affect them can be deadly. Some can also affect people, so be very careful about handling sick guinea pigs. Guinea pigs are prey to many bacterial infections, and you can't tell the difference by simply looking at your sick pet. If your guinea pig develops any signs of illness, take him to the vet for an examination and diagnosis. The adenovirus affects only guinea pigs. If your pet comes down with adenovirus, he could suffer from pneumonia. The Merck Veterinary Manual states that some guinea pigs carry adenovirus but remain asymptomatic, but the percentage of asymptomatic carriers is unknown. Guinea pigs that do come down with pneumonia caused by the adenovirus are usually young, old or with compromised immune systems. Guinea pigs tend to be nervous, so stressful situations affect their immune systems. While guinea pigs can survive pneumonia brought on by the adenovirus with veterinary and supportive care, sometimes the first sign of pneumonia is a dead guinea pig. 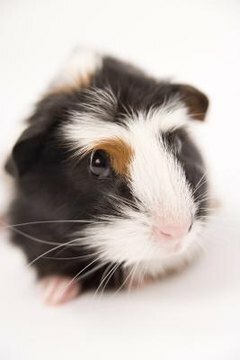 Symptoms of guinea pig adenovirus pneumonia include nasal discharge, labored breathing, appetite and weight loss, fever and depression. Your vet will take blood for testing to confirm it is adenovirus and not a bacterial infection. Your vet might prescribe antibiotics and give your pet intravenous fluid therapy. If your guinea pig shares a cage, you must separate him from his companion while he recuperates. Keep a close eye on any other guinea pigs for symptoms, as adenovirus is quite contagious. The viral disease lymphocytic choriomeningitis doesn't just affect guinea pigs and other rodents, but also dogs and people. Guinea pigs shed this virus in their saliva and urine, so if your guinea pig appears ill, use gloves to handle and clean up after him. Symptoms include seizures, extended legs and little or no movement. Clinical signs include decreased growth, reluctance to move, light sensitivity and conjunctivitis, an inflammation of the eyes. The virus can enter your body through open lesions or inhalation, as well as getting into your conjunctiva. It might not affect you at all, but you could think you have the flu. Rarely, but dangerously, it can cause meningitis in people. Less common viruses affecting the guinea pig include the herpesvirus, which causes abortion in pregnant animals. The rare "Guinea Pig X" virus causes hepatitis in about half of exposed animals. The University of Alabama states, "Serologic evidence for other viral infections has been found, but no disease is known." That means that researchers have found evidence in blood serum tests for other viruses, without knowing of any animals affected by disease. Can Pet Mice Make You Sick?